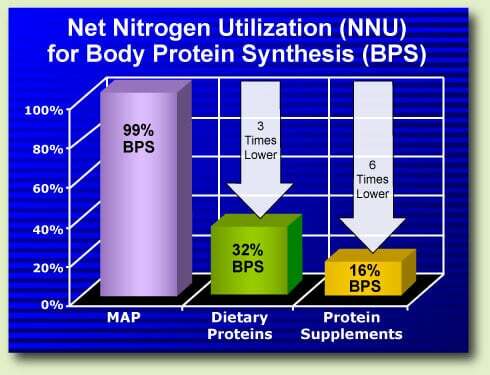 Results of this multicentric study have shown that by giving Master Amino acid Pattern (MAP) as a sole and total substitute of dietary proteins to 500 overweight participants undergoing the American Nutrition Clinics/Overweight Management Program (ANC/OMP), the participants’ body nitrogen balance could be maintained in equilibrium with essentially no calories (MAP 1 g=0.04 kcal), thereby preserving the body’s structural and functional proteins, eliminating excessive water retention from the interstitial compartment, and preventing the sudden weight increase after study conclusion commonly known as the yo-yo effect. Study results have shown that the use of MAP, in conjunction with the ANC/OMP regimen, has proven to be safe and effective by preventing those adverse effects associated with a negative nitrogen balance, such as oversized or flabby tissue, stretch marks, the sagging of breast tissue, increased hair loss, faded hair color, and fragile or brittle nails. Also prevented were those anomalies commonly associated with weight-loss diets, such as hunger, weakness, headache caused by ketosis, constipation, and decreased libido. The use of MAP in conjunction with the ANC/OMP also allowed for mean weight loss of 2.5 kg (5.5 lb) per week, achieved through reduction of excessive fat tissue and elimination of excessive water retention from the interstitial compartment. The Master Amino Acid Pattern has no waste and is used within 23 minutes!